How is Whitelisting an improvement over traditional AV Software? Traditional security software uses a blacklist approach; which is a list of all known malicious files, and prevents them from running. Unfortunately, this list changes day-by-day, perhaps even minute-by-minute. Thus making it impossible to keep it up to date. With this approach, there will always be a victim. In order for a bad file to be identified, it infected someone, somewhere. With whitelisting, there is no victim. Only tested, safe programs and files can run. Simple as that. Why is this more important than ever? One word, ransomware. Ransomware has taken the world by storm, and the epidemic isn’t slowing down anytime soon. The only way to effectively block ransomware is with whitelisting technology. The United States government and cyber security experts have expressed how the use of whitelisting technology can effectively help prevent a ransomware infection. See how ransomware is quickly spreading across the U.S. in these recent news articles relating to ransomware attacks. Whitelisting - the Proof is in the Press! Application Whitelisting should be an integral component of a defense-in-depth solution." 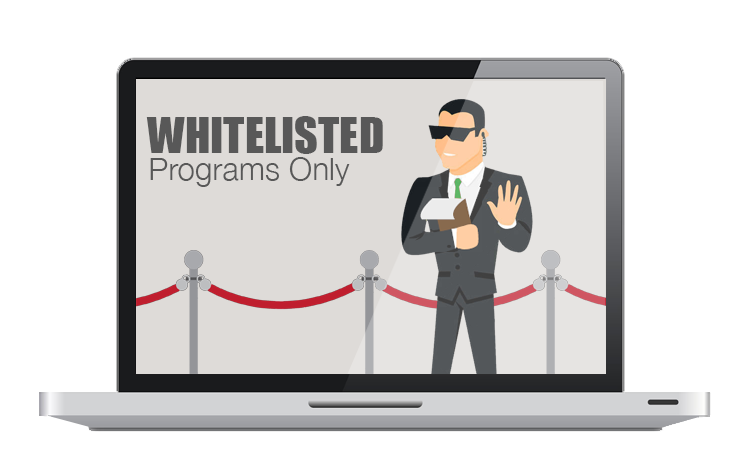 Application whitelisting is surely one of the reliable solutions available today..."
Utilize application "whitelisting," which allows only specific programs to run on your computer. This will prevent malicious programs from running on your computer." Application whitelisting is one of the best security strategies as it allows only specified programs to run, while blocking all others, including malicious software." Instead of using what our competitors use, an archaic blacklist approach, PC Matic uses a proprietary whitelisting technology for real-time protection against ransomware, advanced persistent threats (APTs), polymorphic viruses and zero-day attacks. PC Matic provides superior security protection over all security products, free or otherwise, on the market. On top of that, PC Matic keeps your computers running at peak performance even after years of use. PC Matic is owned and operated by PC Pitstop, Inc.. Copyright © PC Pitstop, Inc. All rights reserved.